From the Book Jacket: "Honesty is the best policy." That's Frank's motto. He tells the truth, the whole truth, and nothing but the truth. But Frank's overly frank comments tend to annoy his friends, his teachers, and even his mother - and now Frank is honestly unhappy. Why It's On My Bookshelf: "I really love the book you just read." This was a comment I received from a teacher after reading Being Frank to her second grade class. When I get good teacher feedback, I know I've got a great one on my shelf. This is a social skills WINNER. 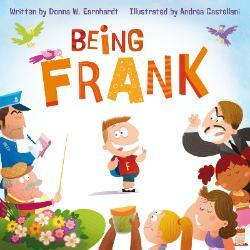 Being Frank teaches kids the importance of THINKING before they speak. Your words can either build people up or break them down. Frank had a big impact on our students. I used the metaphor from the book about how our words are either like sugar or pepper. They can leave a person with either a sweet or bitter feeling. This book has breathed new life into some of my social skills lessons. It is a MUST.